Guarding the Tomb of the Unknowns, Washington, D.C.
As a new photoblogger on WordPress, I’m learning that the art of photoblogging can be so much more than posting “pretty pictures,” especially since my definition of ‘’pretty” may be very different from yours. So while I have old pictures I would like to share and am looking forward to sharing new pictures, I realize I need to offer more than just my interpretation of pretty. But what? WordPress came to the rescue last week. Its contributors offer an impressive array of posts dedicated to helping bloggers, new and seasoned, successfully and effectively navigate the blogosphere. One such post discussed the concept of three-picture stories and challenged bloggers to put the idea into practice. It was my ah-hah moment. At the entrance to the Tomb, a reminder to visitors. Fast forward a few days to the first warmish, sun-filled day Washington, D.C. has had since … well, since sometime in 2013, that’s for sure. Armed with the exuberance of finally having my photoblog up and running, I took a trip to Arlington National Cemetery, with my Nikon D90 on my BlackRapid strap, my Hoodman (so important on sunny days), my LowePro backpack (boy, did I look the part or what? ), and my obliging hubby. We spent a few hours walking the roads of the cemetery, visiting the Kennedy grave sites, the memorials for the USS Maine, the Space Shuttle Challenger, and the Space Shuttle Columbia. We saw headstones for those who served in WWI, WWII, Korea, Vietnam, the Civil War; for wives; for infants (one who died on the day of his birth); and for countless other brave men and women who gave their lives in service to the United States. Of course, what most tourists want to visit at the cemetery is the Tomb of the Unknowns to watch the Changing of the Guard ceremony. Though my husband and I have witnessed this impressive ceremony before, it had been many years and we were eager to see it again. And see it we did. Twice. From two different perspectives: one, seated directly in front of the Tomb; the other, seated at the far right, where the presentation of arms and the inspection of the incoming guard take place. (Good visitor tip!) And the second time, we were also fortunate to see the wreath laying ceremony. Again, twice. I was in photography heaven. And that is how I ended up with over 250 photographs on my memory card. Could I possibly distill down to three pictures all that I had seen during the afternoon? Impossible, until I realized I actually had four different stories I could tell: visiting Arlington Cemetery, guarding the Tomb, the Changing of the Guard ceremony, and the wreath laying ceremony. While I still needed to get down to 12 photos, the task became much less daunting. In fact, I viewed my pictures with a much more critical eye and found it rather liberating to embrace the simplicity of the end result. 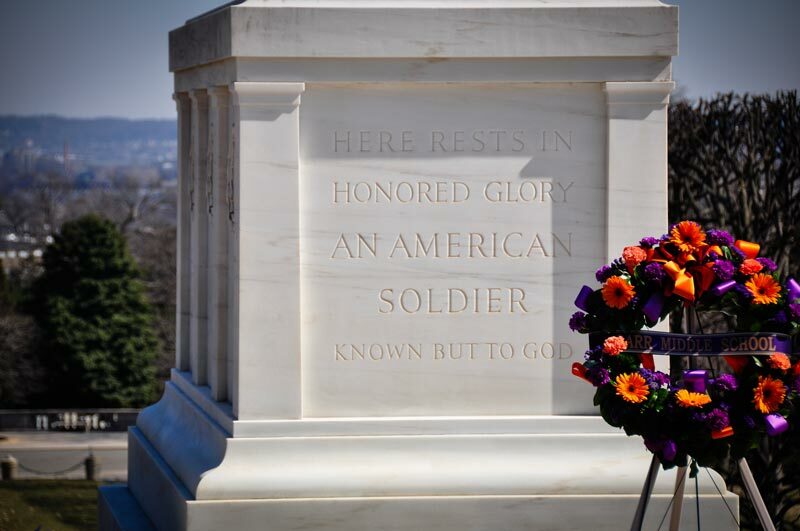 The Tomb rests atop the grave of the Unknown Soldier from World War I. The crypts of the Unknowns from World War II, the Korean War, and the Vietnam War lay to the west of the Tomb under white marble slabs set flush with the plaza. 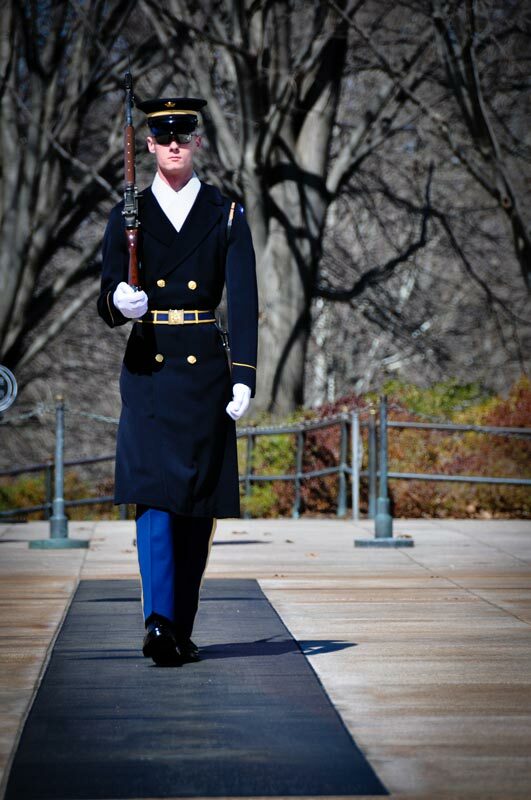 On the plaza, a guard walks the mat in measured steps, 21 paces down, 21 paces back, alluding to the highest honor given any military or foreign dignitary: the twenty-one gun salute. 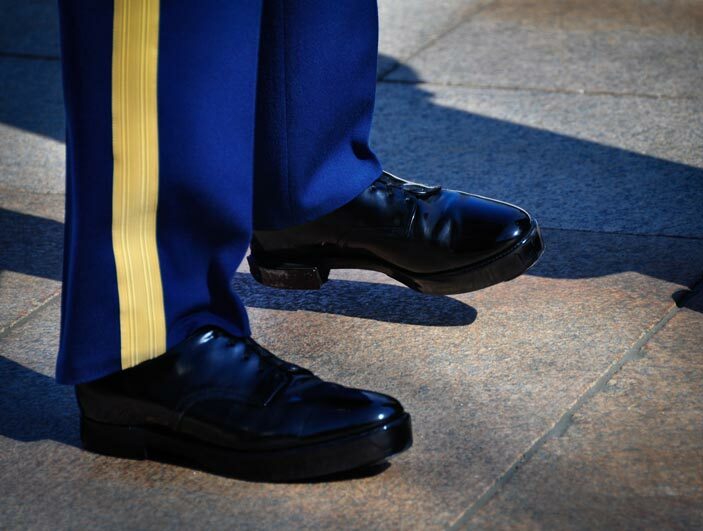 The iconic click of a guard’s heels is made possible by the steel “clickers” on the inner edges of both shoes. How do you think I did? Is less truly more? And what about using the captions – do you think they add to or detract from a three-picture story? I’d love to hear your thoughts! 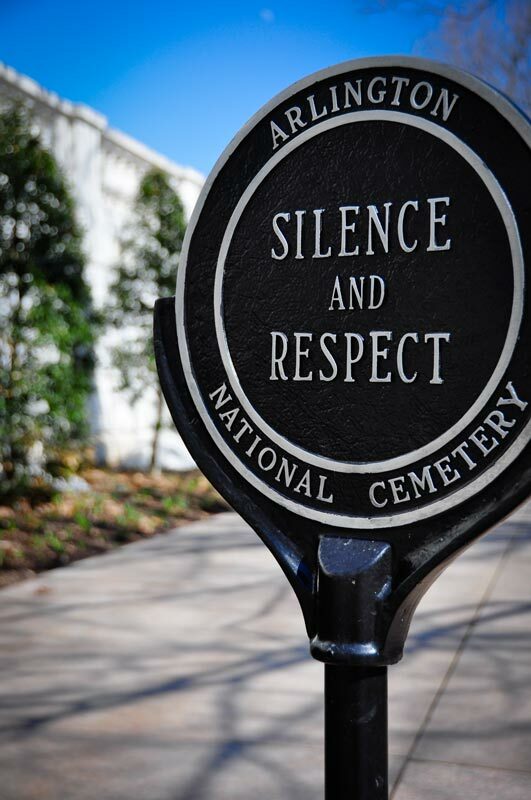 This entry was posted in Architecture, Monuments & Memorials, Washington, D.C. and tagged Arlington National Cemetery, cemetery, guards, memorials, photography, Tomb of the Unknowns, Washington DC. Bookmark the permalink. The photo of the guard is excellent as well. The analogy to the trees that frame him in the background really adds strength to the composition. Scott, I have to admit that I hadn’t made that connection until you pointed it out. The trees were unavoidable in the shot; I just knew I wanted a shallow depth of field. Now each time I look at the photo, I’ll always think of your comment and smile. What a wonderful interpretation! I was drawn to the photo of the tomb. I’ve seen many images of this tomb, but your camera settings and composition really bring out the emotion of being there. Thanks, Scott, and thanks for your request. I’m looking forward to reading your post. Really great post, Stacy! I love the picture of the guard taking his 21 paces.I didn’t realize there was a certain number of steps taken let alone the significance of it. Your pictures told a beautiful story. Thank you! Thanks, Laura! 21 is repeated throughout a guard’s walk: at the end of his 21-step walk (which is set to 72 beats per minutes), a guard turns and faces the tomb for 21 seconds. He then swivels to face back down the mat, shifts his weapon to the outside shoulder, waits another 21 seconds, and takes another 21 steps down the mat. He repeats this process until another guard change (every hour Oct through March; every half hour April through September). It’s beautiful to watch, as is the Changing of the Guard ceremony. I plan to write about that at some point too. Love the shoe clicker, great image. Finding the gems in a “roll” is the fun part of photography. Thanks, Sally. That was by far my favorite “find”! Yes, less is truly more. Like the captions – added to photo story. Really like the FAQ option! Learned so much. Can’t wait for more! Reading while drinking a soda for lunch break. Stacy, you continue to amaze. Feel like I was there without leaving my chair. 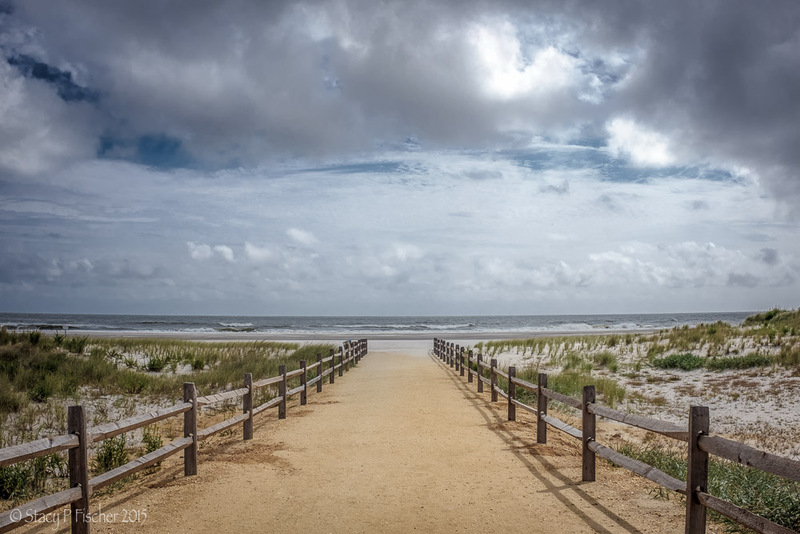 Thanks so much for the input, Debby, and the follow too! It’s always great to be able to “see” my posts through others’ eyes, and you have some of the very best!